STX Entertainment released the outrageous red band trailer for their R-rated comedy The Happytime Murders last week, which also played before screenings of Deadpool 2, and it seems the creators of the long-running kids show Sesame Street are none to happy about it. 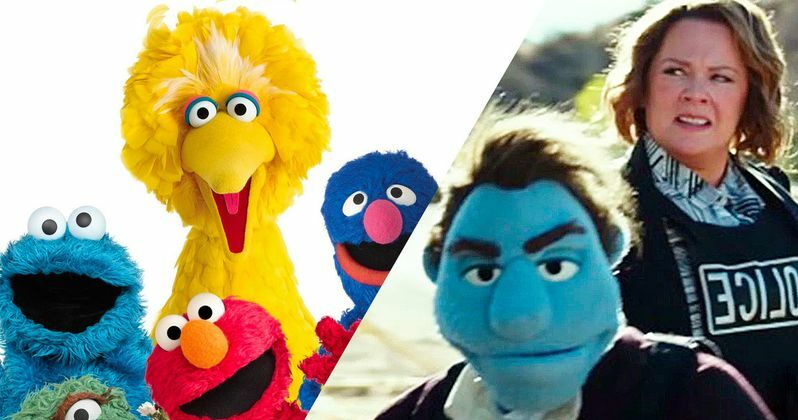 The creators of Sesame Street filed a lawsuit in New York, demanding that STX ceases referencing Sesame Street in their marketing materials, including the trailer that featured the tagline, "No Sesame. All Street." Here's an excerpt from the lawsuit, which alleges STX seeks to, "capitalize on the reputation and goodwill of Sesame Street." "While the trailer at issue is almost indescribably crude, Sesame is not trying to enjoin defendants' promotion or distribution of their movie. It is only defendants' deliberate choice to invoke and commercially misappropriate Sesame's name and goodwill in marketing the movie, and thereby cause consumers to conclude that Sesame is somehow associated with the movie, that has infringed on and tarnished the Sesame Street mark and goodwill." The lawsuit also includes a number of screengrabs of social media reactions to the trailer, which was released on May 18, with one Twitter user claiming, "I'll never look at muppets/sesame street the same way." The same day the trailer was released, the Sesame Workshop, the non-profit organization that runs Sesame Street, sent a letter to both the in-house counsel of STX and The Henson Company, which produces the film, demanding that they stop referencing Sesame Street. STX responded by issuing a statement of their own, attributed to a fake Muppet lawyer named, "Fred, Esq." Here's the STX statement below, which mentions the film's director, Brian Henson, son of the legendary Jim Henson who now serves as chairman of The Henson Company. "STX loved the idea of working closely with Brian Henson and the Jim Henson Company to tell the untold story of the active lives of Henson puppets when they're not performing in front of children. While we're disappointed that Sesame Street does not share in the fun, we are confident in our legal position. We look forward to introducing adult moviegoers to our adorably unapologetic characters this summer." STX will release The Happytime Murders in theaters this summer, arriving August 17 alongside Sony's Alpha starring Kodi Smit-McPhee and Three Seconds starring Clive Owen. Warner Bros.' Crazy Rich Asians, starring Constance Wu and Michelle Yeoh, was originally slated to debut on that date, but it was recently pushed to a Wednesday release on August 15, just a few days before The Happytime Murders. This report on the lawsuit from Variety doesn't specify whether or not the Sesame Workshop is seeking any damages, or trying to stop the release of the film outright. The Happytime Murders stars Melissa McCarthy as an LAPD detective, who reunites with her former partner, a puppet who has now become a "puppet-eye," to try and solve a string of grisly murders of former cast members of a hit 1980s TV series known as The Happytime Gang.